Whenever you find yourself in a pinch for a new recipe, wondering how to cook a specific ingredient, or looking for ideas from a certain ethnicity Epicurious.com is the go-to site. They have bailed me out countless times and I cannot recommend them enough. This recipe is just one fine example of the many you will find there. Happy Mother’s Day and God bless all of the Moms! To the rest of you…please make this day special for your Mom for without her where on earth would you be? 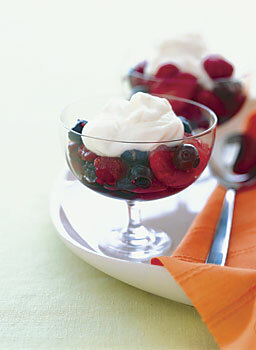 Combine whipping cream, mascarpone, 3 tablespoons sugar, and limoncello in large bowl. Beat until soft peaks form. Combine all berries, raspberry preserves, lemon peel, and remaining 1/2 cup sugar in another large bowl; toss gently. Divide berry mixture among 8 coupes. Top with mascarpone cream. This entry was posted in Dessert and tagged berries, dessert, epicurious, epicurious.com, fresh, fruit, Italian, limoncello, mascarpone. Bookmark the permalink. This sounds so wonderful and so beautiful to serve!